Even when there are no new houses to look at, there is plenty to keep me busy. Another side of searching for greener housing is getting ready for the move into a smaller place. This means paring down what we have collected over the years in a space that has abundant room for keeping things. First stop: Books. I have shelves full of books that I have read and loved for many years. But I also have developed an allergy to any book that is more than a few years old. If I want to read one of my older books, I have to put on a mask and gloves, and even then I might get a headache from it. So perhaps now is a good time to let go of most of these old friends, and to pass them along to others who can enjoy them. I had to take a deep breath when I thought about actually giving away my books. I decided to take pictures of the books on the shelf, because it makes me happy to see the titles there. And I still have to keep a few of my long-time, life-changing favorites. Even with a mask, I might need to read them again. I will also keep the books I am currently using in my work. In other words–I will still have a lot of books, just not as many as before. 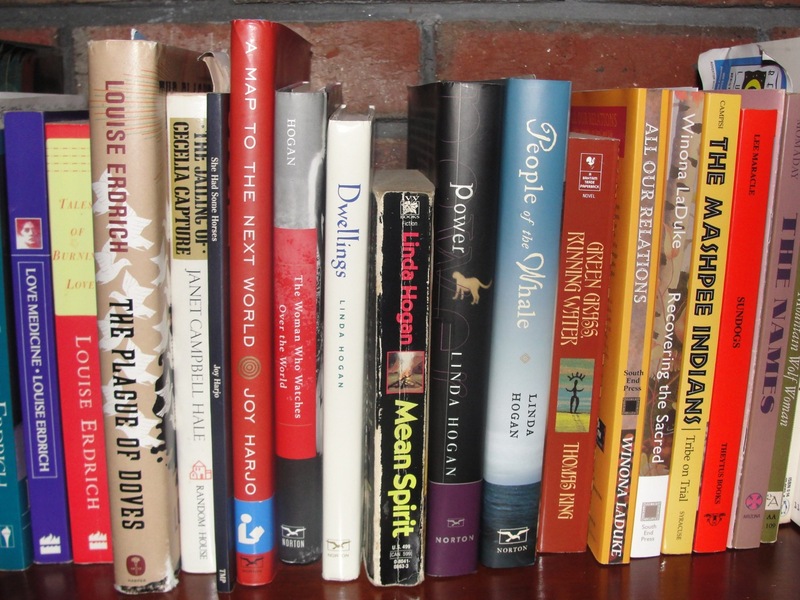 I learned that our local independent bookstore, Longfellow Books, will take used books in trade for store credit. You can only bring in one bag or box at a time. My first grocery-size brown bag netted about $14 in store credit. It’s not a way to get rich, or even get very many new books. But it is a way to re-use and re-cycle and get a few new books, and support a great local institution. I also did some research to see if prisons would accept book donations for their libraries–but I learned that certain ingenious addicts had figured out a way to import drugs into the prisons through book donations from their friends–so no more donations are accepted from individuals. But then, I heard about a Native group collecting books by Native authors to donate to the prison for the benefit of American Indian prisoners in Maine. I can’t imagine a better home for these particular treasures. I gathered two boxes that I will drop off. I now know that the Portland Public Library will take book donations, and that Preble Street accepts donations of books and magazines for its center for homeless youth and adults. There is a kind of joy in simplifying one’s life, in having fewer possessions to haul around. But it is an even deeper joy to think that someone else might be inspired through these books, by insights and stories that were so important to me on my journey. This entry was posted in Awake to Each Other, Awake to Earth and tagged #searchforgreenerhousing, Books, Community, Green Living, Recycle, Simplify, Spiritual Journey. Bookmark the permalink. ← Why find greener housing, anyway?